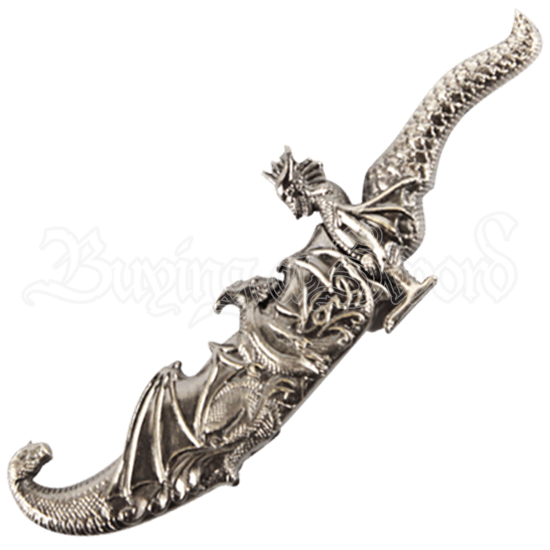 No matter where the modern adventure leads, carry a piece of the medieval realm wherever you go with the Miniature Dragon Dagger. The mythical beasts that decorate this pocket blade will aid you in the daily tasks that await you. Made from durable stainless steel, the straight-back blade offers utility and function for the everyday challenges that confront the modern knight. A cast metal image of a winged dragon forms the handle, while another detailed dragon decorates the scabbard. Sized appropriately for the pocket, this nifty blade will come in handy regardless of the era in which you dwell.